Join the discussion on our forums! 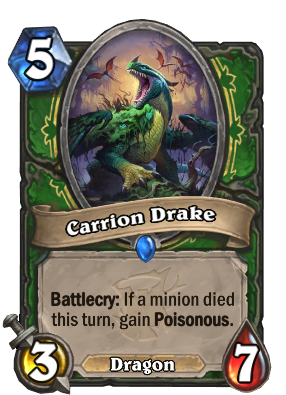 Come discuss Carrion Drake over in our dedicated Carrion Drake discussion topic. Don't think the comparison to Maexxna is fair. Not only is this one mana cheaper which is a huge deal, but it doesn't have a crippling weakness to Stampeding KOdo and Cabal Shadowpriest, which was relevant back in the day. That said, it's still pretty mediocre. Like Maexxna the problem with big poisonous minions without taunt is your opponent can decide how to handle them or if they're aggro just ignore them. It's also a dragon so it has no synergy with hunter. Ehh.. this wouldn't even be a good card if it was 5 mana 3/7 Poisonous it's like.. that one legendary from Naxx the spider that's name i forgotten. it's just pretty much got one more attack and.. 1 less hp and costs a little less. if it was a 4/7 it'd be insane lol the fact it just Dies to Pain, and can just be removed easily. and i mean... we have other poisonous cards that cost 5 mana and they don't see play.... ever..
rip this card is so cool... if only it was in another class would probably make a better rogue card that can afford to play a slow card as they have in the past or even priest. Maexxna is what I believe u meant. Basically, it will always trigger. Love the fact that they made dragon hunter kinda viable. If not in Standard, then definetely in Wild. Easy condition to meet, good stats, and useful ability. Plus it's a dragon in Hunter so I like this card. Because Venomancer exists. It would be too unfair to just have a 3/7 poisonous, even if its a class card. That why there is the handicap. Plus its a Dragon. Yeah it is a little redundant ,but I think they are just trying to encourage trading rather than go face all the time which is what hunter usually did. I like that they are going for control hunter. I knew i wasn't the only one dreaming of it.